They’re here, and we don’t know what they want. It’s the basis of so many science-fiction films fixated on the idea of extraterrestrial life. Sometimes they come to us for help, sometimes to annihilate, sometimes just to coexist. In Arrival, the cerebral and singular new movie from French-Canadian master Denis Villeneuve, perhaps they’ve come to hold a mirror up to humanity. Shortly after 12 monolithic spacecraft land on Earth, linguistics professor Dr. Louise Banks (Amy Adams) is approached by the U.S. military. Colonel Weber (Forest Whitaker) presents Banks with a recording of the alien language, and asks her to decode it and figure out why they’ve come to our planet. Banks is joined by mathematician Ian Donnelly (Jeremy Renner) as they head to rural Montana—the landing spot of one of the ships. Meanwhile, flashbacks reveal pieces of Banks’ life up to this point: Her daughter died at a young age, and the resulting heartache eventually tore apart her marriage. Every 18 hours a door on the ship opens and allows the military and scientists to enter, and they soon discover that the alien visitors are towering, squid-like creatures obscured by fog in a glass enclosure. Referred to as the Heptapods, they have verbal and written means of communication—the latter formed in disappearing ink that takes the shape of complex spheres. Banks leads the team of scientists in making contact and subsequently trying to decipher the messages. As nations across the world try to coordinate their individual findings with a global coalition, trigger fingers become antsy as some countries consider simply giving up on communication in favor of violence. The importance of Banks’ own life to the movie becomes clearer as she gets closer to cracking the Heptapods’ language. 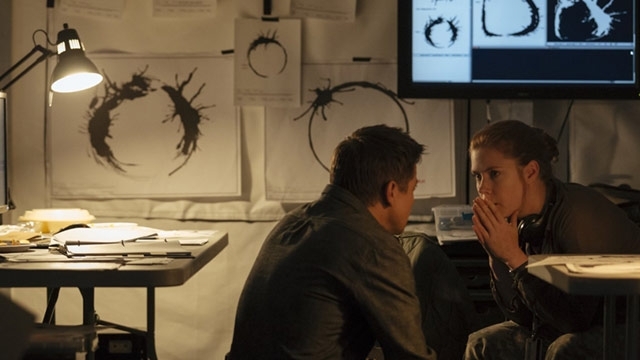 It seems almost imprudent to try to contextualize any more of the plot details of Arrival, which screenwriter Eric Heisserer adapted from the award-winning short-fiction piece Story of Your Life by Ted Chiang. The emotional heft of the picture, which will inaccurately be dubbed a twist, builds over the course of the film as the sense of scope comes into focus along with the characters’ development. Audiences have become trained to anticipate a grand reveal, particularly in modern science fiction, but Arrival skillfully subverts that trend by instead providing a coherent arc toward a moving finale. Villeneuve forgoes grandiosity in favor of simple storytelling. That’s not to say that the subject matter (determinism, communication, geopolitical cooperation) is simple (quite the opposite), but that he’s able to interpret a worldwide event through the lens of a personal story. It’s heady, adult sci-fi dressed up as big-budget fare. In addition, the director has surrounded himself with a cast and crew at the top of their game; this is Amy Adams’ finest work to date, much like Emily Blunt’s performance in Villeneuve’s thriller Sicario was her own personal best. Adams tackles the sadness, curiosity, and fear of her character, shining through when the film reaches its expressive climax. Bradford Young’s cinematography is serene and haunting, while composer Johann Johannsson punctuates the proceedings with an emotive score. Arrival is a terrific piece of genre-melding work, an intellectually stimulating and visually entertaining journey. It’s a profound ride into the unknown as well as a strikingly human film, one that’s concerned much more with the feebleness of language and the fragility of time than with its mysterious extraterrestrial visitors.